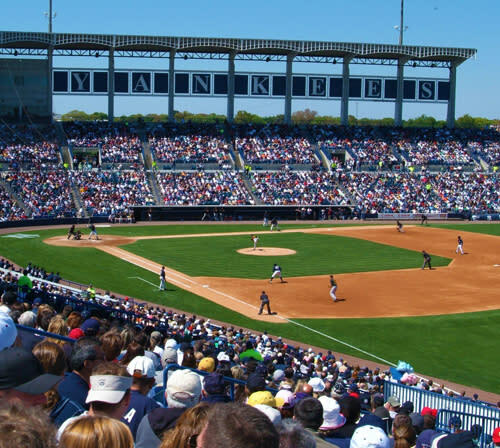 The New York Yankees plan to invest $40 million in Steinbrenner Field, their 20-year-old Spring Training home here in Tampa Bay. The investment means the Yankees will continue to get themselves ready for Opening Day well into the middle of this century. The renovations will include new concourses in the outfield and the addition of “social gathering areas” and more shade, according to a press release. There will also be improvements to the Yankees Spring Training Complex on Himes Avenue. During the summer, the park is the home field of the Tampa Yankees, the Bronx Bombers&apos; Class A farm team. Their games are a great low-cost way to enjoy the National Pasttime and a way to say "I saw him when" as your favorite minor leaguer rises through the ranks. Spring Training has been part of Tampa Bay practically since the beginning of baseball. Before we had our own team, the Tampa Bay Rays, we hosted loads of teams who came down to practice in the sun. The number of Big Leaguers who have passed through Tampa Bay during their careers runs long. Ever heard of Babe Ruth? He hit the longest home run of his career right here -- back when he was a rookie with the Red Sox (sorry, Yankees fans). The boyhood home of our own hometown baseball hero, Al Lopez, will soon become Tampa Bay&apos;s own baseball museum.